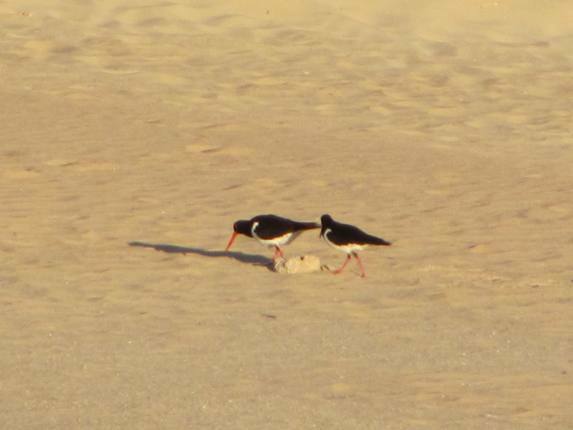 Pied Oystercatcher breeding has started! 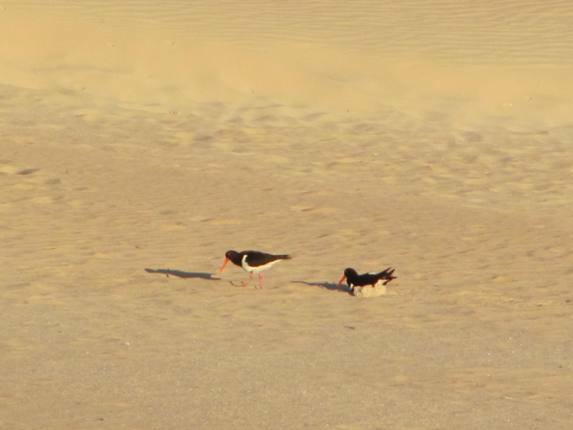 We monitor the Pied Oystercatchers breeding along a 23km stretch of beach each year and it can all be covered on foot or by bicycle-tide dependant! They usually have their first eggs in place by the first week in July each year and they sit on them for 28 days. The first egg is laid followed by the second the next day and then they sit fairly continuously despite the warm day time temperature. On rare occasions we have had three eggs in a nest, but this is unusual in this area. We keep our observations to a minimum to avoid disturbance and usually only visit the nest site once to get GPS coordinates to report to Birds Australia’s Nest record Scheme. With the data we have collected over the years we are hoping to address the predation of eggs by feral cats in the Broome area. The Western Australian government hopes to have new policies in place this year to ensure that all cats are micro-chipped and de-sexed. The feral cat problem has existed in Australia for many years and it will take some time to eradicate them. 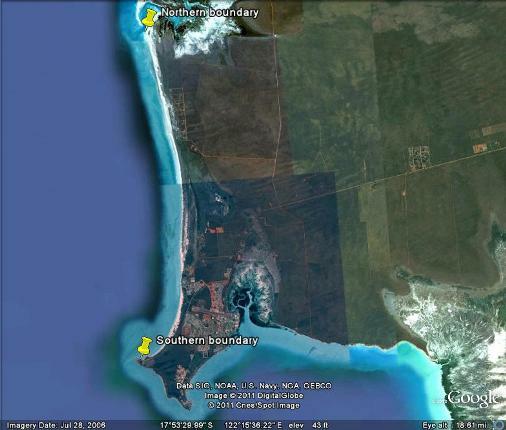 Below is a Google Earth image of the 23kms stretch of beach that we cover. Due to the extensive food source on the reef in the northern section there are 11 pairs in a 7 km stretch and the remaining 5 pairs are in the southern 16km stretch of beach. There have been over 60 eggs lost to predation each year from these 16 pairs of birds and only one successful breeding where the chick has been flying and dependant each year. 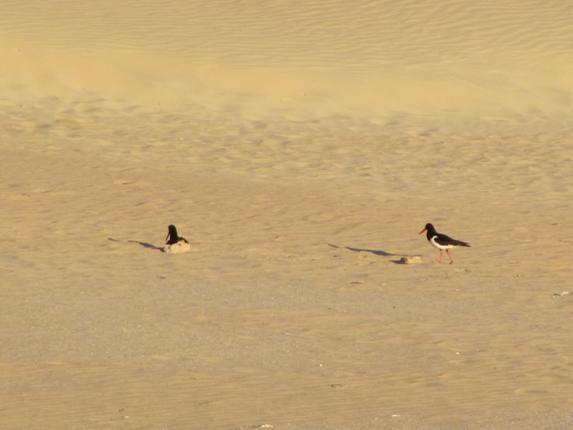 The pairs in the northern area maintain their territory all year and the most southern pair nest about 2kms north of the point, but move to the point for the rest of the year. One pair that is in the main Cable Beach area move over to Roebuck Bay when they are not nesting, but he returns on a regular basis. The sandy beach in that area most likelydoes not provide sufficient food. The nest area has remained consistent for at least 11 years that we know of, though there has been a change in birds! First the male went missing after the 2007 season, then the female got a new mate for a couple of years and she then ran off with the male bird at the southernmost site after he lost his mate during the 2009 season! So, officially they “mate for life”…but not always! Interestingly all of these birds were banded together on the same day in Roebuck Bay several years ago, so they used to hang out together in a flock prior to breeding. We had a new pair arrive in a territory about 7kms north four years ago. No birds had used this territory previously, but it is a busy place. This is where the tourists, nudists, dogs, camels, etc all congregate and it is amazing that they even considered it. They were young and inexperienced the first year and laid eggs, but didn’t bother sitting on them! The following year they were predated and then last year they did hatch, but were predated shortly after. They walked them north to get away from danger and tried really hard at teasing/leading dogs away, but sadly they didn’t make it. They have been busy mating recently and we have a result! The first egg was in place at 9am yesterday in the exact same spot as other years! I visited at 3pm and the birds were on the beach, so I went to see what had happened-another egg was laid. I then walked north to check a further 5km of beach and returned to find the birds in parent mode-one sitting and one guarding. I sat for some time and they did their change, so one could go to get some food/drink at the shoreline. We saw 3 pairs mate in the northern area of the beach last Saturday, so it shouldn’t be long and we will have more nests with eggs in them! That is some amazingly open nesting spots. How do they successfully breed with so many predators? If I have read the posting properly they can’t really be thought of as being successful with only one fledged young each year from the 16 pairs. By anyone’s view that is a very low success rate. 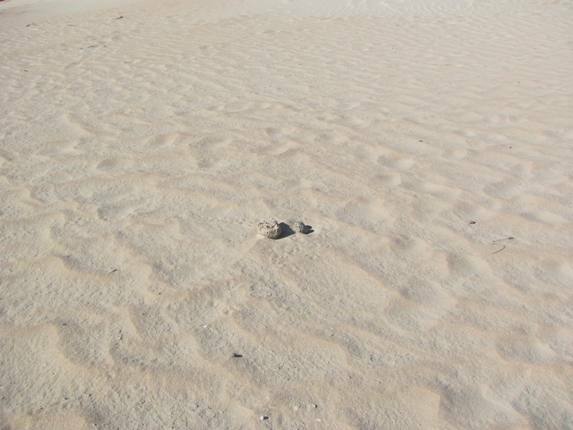 Any ground nesting birds suffer similar problems and with no cover on a beach the nest is open to view. @ Renato and Keith-they are not very successful due to predation, but due to the fact that these birds live for many years (there is a bird over 20 years old in this area) they are able to sustain their population. Although it is exposed it has the advantage of an advance warning of a predator approaching.